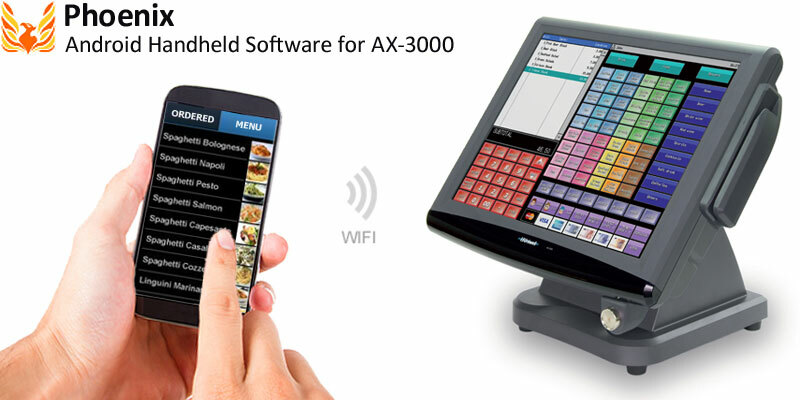 Take customer orders on your Android mobile device directly at the table without ever leaving the dining area or running to and from a stationary terminal. Phoenix handheld application software runs on Android devices, such as smart phones and tablets. Phoenix is designed to work with the AX-3000 to offer maximum compatibility. If you use the latest Android device, you will enjoy its functionality – quick, intuitive, and smooth scrolling, etc. Phoenix order entry software is optimized for Android devices to offer easy-to-use features that can be intuitively learnt, thus Phoenix is quite free from the concept of existing solutions and gives users more free feeling and ease of use. Preset data of AX-3000 to be used on Phoenix Once Phoenix downloads the preset data from AX-3000, a clerk can immediately sign on and start to register PLUs. There is no need to program the Phoenix itself. Security protection by license code generated by MAC address Only a device that is registered on AX-3000 with license code can communicate with AX-3000. Set Menu When a Set menu is selected, you will be prompted to choose course items from the list, the system alerts the user if all set menus are not complete. Condiments, Cooking Instructions When a PLU has a link for Condiments or Cooking Instructions, it will automatically display a list of Condiments or Cooking Instructions to choose from, hence you will never forget to ask customers for their choices. Picture on PLU list You can take a picture of PLU using a camera equipped with the Android device and save it, which is then shown as icon next to PLU name. If you click a picture, it can be enlarged, which can be very nice presentation to customers! Split bill This is a convenient function in case some people in a group require to check out separately. PLU repeat Very easy to register the same items already ordered by other customers. You only need to tap PLU to increment the Qty in Track window. Clerk Open Track List When you sign on, you will see the list of tables you are taking care of to choose from. Close/Media-Close by “Gesture Entry” Gesture Entry to Close/Media-Close operation by one action, without pressing any button. Media Close You can close a table without going to AX-3000 terminal to finalize the transaction. Mobile Printer (Bluetooth Connection) Can be linked with mobile printer for subtotal print via Bluetooth connection. Operator can carry the mobile printer attached to his/her belt and print immediately when commanded from Phoenix. Flexible Printer Selection Printer can be selected at the timing of Subtotal bill and Media close so the operator can select printer for their best performances.